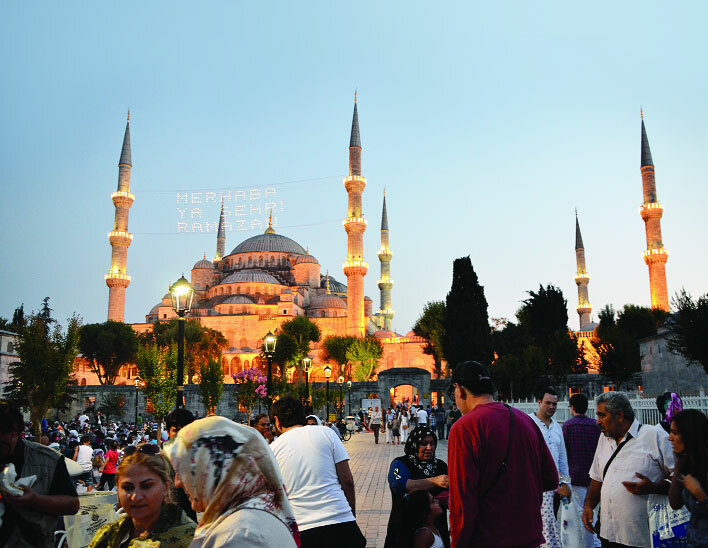 Just as Istanbul manages to straddle Europe and Asia, fuse the ancient and the modern, it also manages to balance traditional and contemporary festivities during the blessed month of Ramadan. Whilst preparations for the month long celebrations start weeks in advance. A sure sign that Ramadan has started is when the Mahya, a pattern of light bulbs hung high above the minarets of the main mosques, lights up with the message ‘Welcome! Oh month of Ramadan’. The tradition of the Mahya dates back from the Ottoman times and its religious message is changed every few days, each one exhorting and encouraging people toward goodness. With the Istanbul municipality having completed its preparations to turn the city into an entertainment centre during Ramadan, there are lots of activities to keep everyone, the young and the old, entertained from Suhur to Iftaar. In fact many restaurants stay open 24 hours during this month to cater for the hundreds of visitors out and about soaking in the festive atmosphere. An hour and a half before the break of dawn, the lone drummer pounds the streets of Istanbul beating his drum and encouraging people to partake in the pre-dawn meal of Suhur. Another ancient tradition that has managed to survive and those who normally sleep through their alarms are safe in the knowledge that if anything can wake them for Suhur meal it willbe the drummer! The main festivities are centred around the magnificent Sultan Ahmet Mosque (The Blue Mosque) and the Cultural Centre. The Sultan Ahmet Mosque gardens turn into impromptu picnic areas with families coming from afar to spend the day in the surrounding courtyard and complex. The courtyard houses an Islamic book fair, with over 50 publishers offering various titles alongside CDs, and other religious accessories. Meanwhile just outside the mosque hundreds of mini-stalls offer traditional bazaar fare, including Turkish arts such as calligraphy, tiling and jewellery. For those seeking Iftaar or post-tarawih snacks, the enticing aromas of sweet corn, sausage sandwiches and roast chestnuts fill the air mingling with those of Turkish coffee, tea and pipes. Another appetizing Ramadan special is the Gullac dessert, made with milk, nuts and coconut, often enjoyed in the many cafes after Tarawih prayers. There is a definite family atmosphere and finding families sipping tea for hours on end waiting for Suhur is not unusual. The Cultural Centre meanwhile has its own special Ramadan guide detailing all the goings on throughout the month. The carnival atmosphere is more `Eid-like with concerts from the likes of Sami Yusuf, Debu and traditional Turkish ilahi (nasheed) performers every evening. The grounds swell with candy floss sellers, puppet shows, roller coasters, charity collectors and performances by Ottoman janissary bands. The atmosphere is very joyful. In the district of Eyup mosque, it lies the graveyard of the Prophet’s Companion Abu Ayyub Al Ansari; it is one of the most religious sites of Istanbul. Visitors pay their respects throughout the year and the area surrounding the tomb and the mosque is crowded everyday of Ramadan. Although most citizens observe the fast during the day, restaurants and cafes are still open catering for the many tourists who visit the city. Similar to the ‘Tables of Mercy’ seen in Egypt during Ramadan, municipalities here set up ‘Iftaar Tents’ which serve food to thousands of people everyday. Iftaar time in Istanbul is definitely a time to avoid being out especially in traffic as the hungry drivers jockey for space on the jam-packed streets and fight to get home before the Adhan. Another thing to try is the bread queue which often extends out into the streets; as Turks try to time their purchase of steaming Ramazan pie to coincide with the Adhan. This delicious flat bread is definitely best eaten warm, however standing in the queue is only for those with enough energy left as the fast comes to a close. Unlike some middle-eastern countries which see an increase of soap operas in Ramadan, television in Turkey sees an abundance of religious and Ramadan related programmes. Suhur meal can be enjoyed whilst watching “Sahur Zamani” live show from Sultan Ahmet mosque with its mixture of Sufi music and popular Turkish nasheeds . Waiting for Iftaar in the company of “Nihat Hatipoglu” on Star TV is a popular pastime as viewers are encouraged to call in with their various queries related to Ramadan in particular and religion in general. Even Kral, the local 24 hour music channel, has a special Iftaar session which shows only religious music videos. So as Turks enjoy the festivities on offer around this wonderful city, a timely reminder is offered by a respected scholar from the splendid Topkapi Palace grounds on one of the many Iftaar programmes. Ramadan, with its celebration of `Eid, is like this world and the Paradise of the hereafter. One can only enjoy and deserve the celebration of `Eid after having observed Ramadan in its true and recommended spirit, just as one only gains and enjoys Paradise having lived in this world on the straight path.